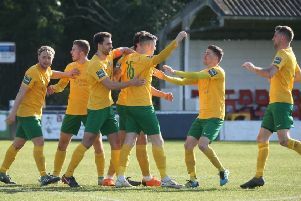 Horsham have been told to go out and enjoy their FA Trophy clash against National League South Bath City on Sunday. An in-form Hornets welcome the promotion chasing Somerset outfit to Culver Road for a third qualifying round tie. It is the furthest Dominic Di Paola’s side have ever been in the prestigious competition, but while they have been told to relish it, it comes with a warning that their visitors will not ‘take much for granted’. Managed by Jerry Gill, a former Yeovil Town, Birmingham City Northampton Town and Cheltenham Town midfielder, he has led The Romans to sixth in the league with nine wins from 17 games. Di Paola is aware that it will be the toughest challenge they have faced yet this season, but having previously pitted his wits against Boreham Wood and Whitehawk, when they were at that level, he is looking forward to it. The Hornets boss said: “I have been putting an aim together of how we want to play this week and then at training on Thursday we will tactically prepare. “It will be a massive step-up for us in terms that they are a team that will be challenging for the play-offs in the Conference South this season - which is a very, very strong league as well. We played Boreham Wood three years ago when I was at East Preston and although we were in it score wise until late on, they bopped us. “Bath are a really strong side, but we will go into it with the target of enjoying the day a bit. “They will be very professional and had people watch us Saturday, at that level they do not take much for granted. It’s a huge step up in power and pace of the game. “I think they will be thinking they could easily make the semi of quarter-finals as some in that league do not take it too seriously. While Horsham will be massive underdogs, their visitors will be wary. Saturday’s 4-0 league scalp of VCD Athletic was a shock result on the fixture for many, but the Hornets have been gradually improving. They have crept into up behind the Bostik League South East play-off places and have high-division scalps to their name already this season - culminating in an undeserved FA Cup third-qualifying round replay exit at Poole Town. Despite this, Di Paola stressed: “We are not getting ahead of ourselves. Genuinely, the boys are aware that there are a lot of tough games coming up - we have Bath, Eastbourne Borough, Hythe and Cray all before Christmas. “There is Three Bridges in that run of seven games as well, who are massively improved as well. “There is lots to work on, but I am loving this season. I did not enjoy last season, so it’s really nice. The weekend’s clash takes place at 3pm on Sunday due to landlords Lancing having a Saturday fixture. A place in the first round of the competition which equates to the last 32 is up for grabs and £5,000 prize money.